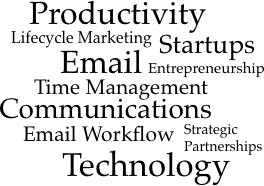 Technotheory.com - Jared Goralnick speaks about email, productivity, and entrepreneurship. Jared Goralnick speaks about email, productivity, and entrepreneurship. With 11 years as a 2x CEO at the intersection of productivity and technology, Jared has presented over 300 times on a wide array of topics. The consistent thread is a focus on immediately actionable concepts and techniques. Presented to Google in December 2012. A YouTube video is embedded on the last slide.